Jedidiah's Jerky is a brand belonging to Jedidiah's Jerky and Gourmet Snacks of Laughlin, NV. It's been around since 2005, owned and operated by David Coffey. Coffey launched the brand to represent lines of specialty beef jerky that afficionados would enjoy. He's a veteran of the jerky snack business going back to 1984, when he started out with Polley's Jerky and later on launched a previous brand, River Run Jerky. His father was also a veteran of the jerky snack business. This line of "Private Reserve" represents a a very soft and tender beef brisket jerky, while their "Premium" line is more of the standard beef jerky. I get a strong sweet taste immediately upon putting a piece into my mouth, with a saltiness coming on just seconds later. The natural meat flavors start showing through after that, and in the chews I can detect some garlic. The teriyaki sauce is there, but I can't really say that it's a strong teriyaki taste, mostly because the sweetness is so strong. Or perhaps it's better to say that the teriyaki sauce is more heavy on the sweet side, and less on the soy sauce. The saltiness is well pronounced in this, however the heavy sweetness balances it out and doesn't really give me a salt-scorching. The natural meat flavors show up in the chews, but I can't say it's a strong taste, mainly because it's masked by the heavy sweet and salty flavoring. There is also a very slight "rank" meat taste, or stale taste. Note that this jerky contains no sodium nitrite, no oxygen absorption packet, and is not vacuum sealed. As for the other seasonings, I can detect the garlic, but mostly during the chewing. For the most part, I don't really taste the black pepper, though there were some cracks and crevices in this jerky that had concentrated amount of pepper, and gave off a good peppery taste. The ginger is something I can sense in the teriyaki sauce. When I let a piece soften up in my mouth for several seconds, I mostly get the heavy sweet flavor, with some saltiness. But the salt really comes out once I start chewing. Overall, this is a sweet & salty variety of jerky. You could rightfully call it a teriyaki variety, but only if you call it an extremely sweet teriyaki. This stuff is basically "meat candy", and is supported by the very high 13g of carbs per 1oz serving on the nutrition label. This appears to be whole cuts of real meat, sliced thin, and in strips of ranging from 5-10 inches in length. 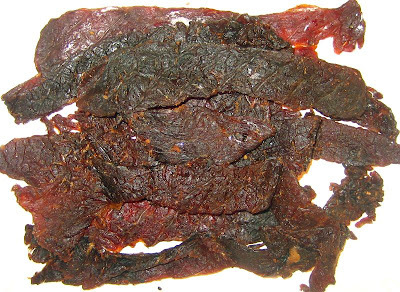 This is a soft and tender variety of jerky, though not necessarily moist. It's very easy to tear apart and chew. In fact, it's so easy to eat that I find myself having to slow down so that I don't run out before finishing writing this review. As with beef brisket, there's a good deal of marbilization, and plenty of "membrane" covering the edges of these slices. That membrane does remain in my mouth in a little chewy ball, but can be easily swallowed. Otherwise, I don't find any tendon or gristle. If I could recommend a beer with this jerky, it would be a watery beer, something very light on flavor, maybe a Bud Lime. Overall, this jerky has a great meat consistency that doesn't interfere with my enjoyment of the flavors. Jedidiah's Jerky and Gourmet Snacks sells this Teriyaki variety from its website at a price of $7.99 for a 3.65oz package. That works out to a price of $2.19 per ounce, putting this into the expensive price range. 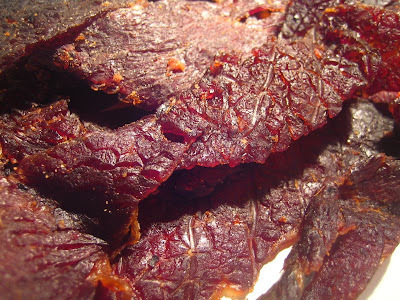 For general jerky snacking purposes, this has a decent value considering it's packed with a lot of flavoring (mostly sweet & salty), is very easy to eat, and provides a lot of snackability. If it were priced about 50 cents lower per oz, I'd say it would have an excellent value. As a teriyaki variety, that value could swing either way depending on your tastes. If you like heavily sweet teriyaki, then it's a great value being that's exactly what this is. Otherwise you might see this as being a waste of money for something that tastes like meat candy. This teriyaki variety from Jedidiah's Private Reserve offers a very soft and easy-to-eat jerky with a liberal dose of sweet teriyaki taste against a good natural meat flavor. But that teriyaki flavor is extremely sweet, to the point where you might find yourself making a face and handing it off to your toddler to stop him from crying. Nutritionwise, this is one of the worst, being very high in carbohydrates (for jerky anyways), high in sodium, and high in calories. However, it's lower in cholesterol than most jerky. This isn't a jerky you'd want to diet with. But I still find it quite snackable, and it's easy-to-eat consistency has me eating it very quickly. Considering it's high price point, you'd have to train yourself to eat this slowly or else that $7.99 price might only provide you with 5 minutes of snacking fun.